GW Hillel will soon tear down its more than 30-year-old building on H Street and replace it with a four-story structure equipped with a kosher dining venue. GW Hillel will soon tear down its more than 30-year-old building and replace it with a four-story structure equipped with a kosher dining venue. 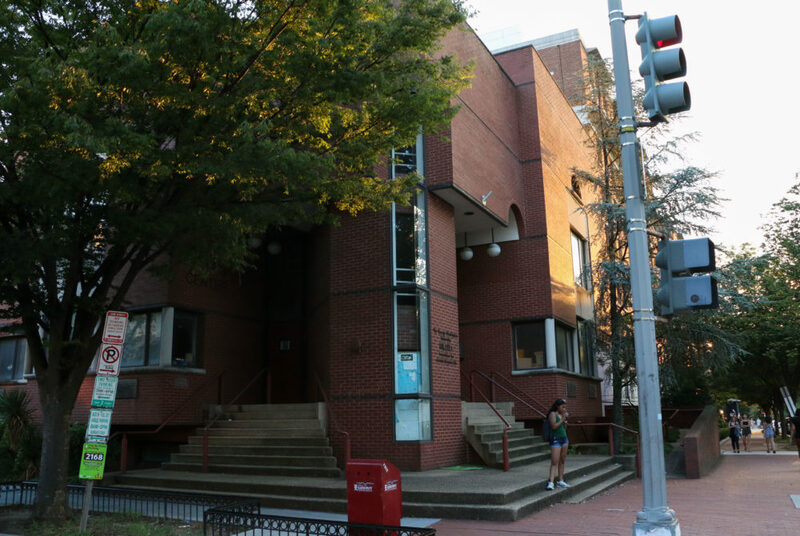 After the D.C. Zoning Commission approved renovation plans for GW Hillel’s building on 23rd and H streets July 30, the organization is hoping to begin construction on the new building this fall. The construction marks the official end of a nearly four-year-long battle with Hillel’s neighbors and will give the group a permanent home for the first time since 2014. “Having a space that we can really utilize, build a community out of and have to be a home away from home for students on campus – and to be able to use it in partnership with the wider University – is a really invaluable opportunity,” Adena Kirstein, the director of Hillel, said. Hillel’s building has been vacant since 2014, when the organization first moved out of its townhouse to prepare for multimillion-dollar renovations. But St. Mary’s Episcopal Church – Hillel’s neighbor – and the West End Citizens Association attempted to shut down the project in 2015, arguing that renovations would damage the church and block its access to H Street. After the D.C. Zoning Commission gave Hillel initial approval to move forward with the project in November 2015, WECA and the church filed a lawsuit in May 2016. The D.C. Court of Appeals upheld the D.C. Zoning Commission’s decision in December. But Hillel leaders are now moving forward with the project with the support of WECA and the church after modifying building plans in April. The new proposal makes the building footprint about 20 percent smaller than the previously approved plans, according to Hillel’s zoning application. Barbara Kahlow, the treasurer for WECA, said the organization “fully supports” the new building plan because it is farther away from the church than initially designed. The new four-story building – which is set to open in spring 2020 – will include a full kosher dining facility in the basement and two floors specifically for Hillel. The third and fourth floor will be leased by the University and the rooftop will be available as an outdoor space for the organization, Kirstein said. She said the kosher dining vendor will be on GWorld and available to all students, but officials haven’t yet determined which company will be used or what food will be offered. She said the organization is in the process of finalizing the construction company that will work on the building. Kirstein added that Thomas LeBlanc, the University president, and Alicia Knight, the senior associate vice president of operations, supported plans for the new building. Knight said the University provided feedback for Hillel’s design plans. She said the University has not yet determined how it will utilize the top two floors of the building and will decide closer to the opening date. “We are looking forward to seeing this new building open, as it will provide quality community space that will lend itself to helping to build and strengthen community amongst students,” she said. Liora Bernstein – a senior and the president of the Jewish Student Association, the student arm of Hillel – said that not having a large building dedicated to Hillel after the organization moved out in 2014 has been difficult because the organization’s current townhouse on F Street is too small to hold events. “We try and do it outside for as long as possible until it gets cold or it’s raining because we really can’t fit that many people comfortably in the townhouse,” she said. Bernstein said the new building will serve as an alternate place for students to study and relax and give the community a more consistent meeting place, compared to renting out spaces and using the current cramped townhouse. She added that the new kosher option in the basement of the building will help students who want to keep kosher because there are currently just five kosher options on campus.